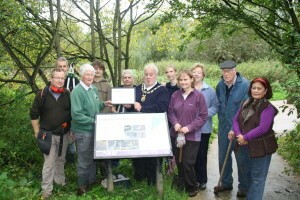 Mayor Chris Petty in Conigre Nature Reserve. THE South West in Bloom’s ‘It’s your Neighbourhood Award’ has been presented to Conigre Nature Reserve by Melksham Town Council. At a presentation held at the nature reserve itself, the Mayor of Melksham, cllr Chris Petty, handed over the award to Gill Cardy who is a volunteer at the Conigre Nature Reserve. Gill Cardy who received the award on behalf of the nature reserve said, “It is very pleasing to be able to receive the award as a lot of hard wok goes into maintaining and improving the area.